Obituary – Kemnitz, Robert Albert « Perry High School Alumni Association, Inc.
﻿Former Perryan Robert Kemnitz, 42, died at 2;30 a.m. Sunday at his home at Stillwater. A memorial service has been set for 10 a.m. Tuesday at the Assembly of God church of Perry. Rev, James Guerrero, pastor, and Rev. Ruth Tipps will officiate. Arrangements were under direction of Brown Funeral home of Perry. Kemnitz was born at Perry, Jan. 29, 1947. He was the son of H. E. and Alida Kemnitz. He was a graduate of Perry high school and attended Central State university. He worked as a feature writer and music critic for the Los Angeles Times and also had been employed by the Children’s Homes Society of Los Angeles. In 1985, Kemnitz began work with the Oklahoma Department of Human Services. 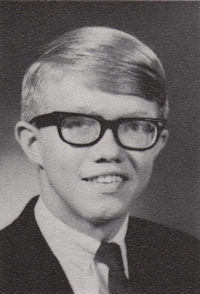 Survivors include his mother, Mrs. H. E. Kemnitz, Perry; two sisters, Carole Jean Kemnitz, Stillwater, and Mrs. Bill (Linda) Tressler Perry; a niece, Jennifer Tressler, and a nephew, Terry Tressler.